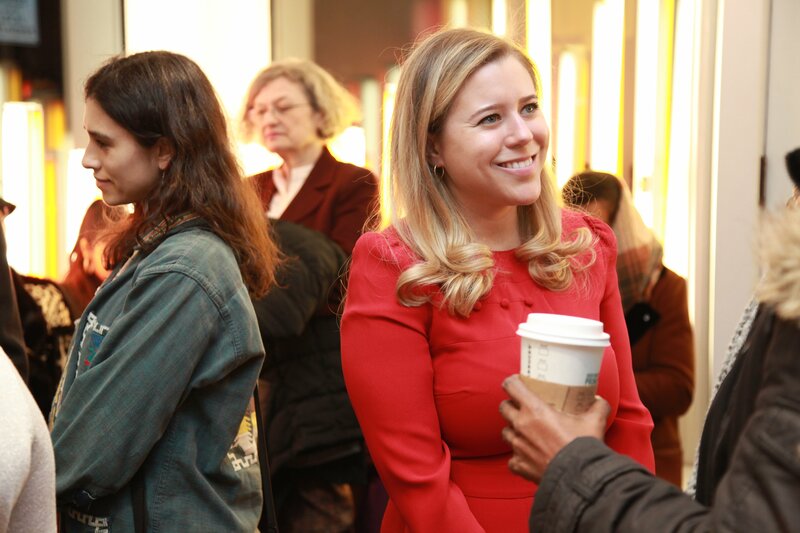 I first learned about Charlotte Japp and her Brooklyn-based intergenerational networking startup CIRKEL in a New York Times piece titled “The New 50s: Far From Retirement,” written by my Encore.org colleague Marci Alboher. Not only was I drawn to her idea of bringing generations together for professional development and fun. But, at just 28 years old, she struck me as a great example of a young leader in the Gen2Gen campaign. Hungry to learn more, I reached out to ask her some questions. Why the funky spelling and the name CIRKEL? A circle is a perfect analogy for bridging the gap or closing the loop between generations. Everything in life is referential, and if older people and younger people can exchange knowledge and experiences, the world will be better for it. 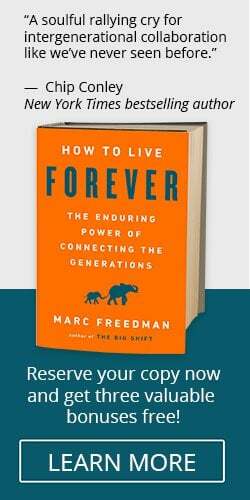 Marc Freedman makes a similar visual comparison when he describes intergenerational connections as “puzzle pieces” in his book, How To Live Forever. Also, my mom is an art advisor specializing in selling paintings and furniture. Growing up, she exposed my brother, sister and me to things that were not only beautiful to look at, but also solved a problem. The classic design phrase is “form follows function.” Swedish design has always been my favorite, and I was in Stockholm when some friends and I came up with the name “CIRKEL” to represent smart, social design. What is CIRKEL and why did you create it? It’s an intergenerational networking platform that brings people from different age groups together for mutual growth – both personally and professionally. There are several factors that inspired me to create it. First, I saw both of my parents get aged out of their primary careers at around age 50. And as I grew into my own career at the media company VICE, where even many executives were below 40, I experienced the consequences of age segregation first-hand. I learned that ageism not only affects older people who are left out of work, but it also deprives younger people from seasoned knowledge and perspective. 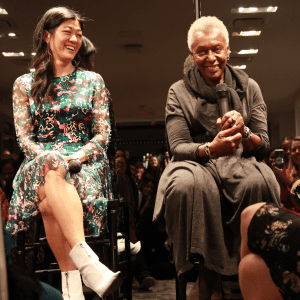 The workplace is a really clear example of how intergenerational connections strengthen us collectively, but that kind of connection is powerful in interpersonal relationships as well. Plus, I’ve always felt that the most fun parties and cultural events are the ones where people from all different ages and walks of life are enjoying it together. Have you always enjoyed the company of older people, or did your passion to connect generations arise more recently? I’ve always considered myself an “old soul” and appreciated meeting people who were older than me. This has been especially true in times of uncertainty, either in my career or personal life. I love asking for advice from someone who’s lived it multiple times over. No one gives relationship advice like someone over 50! In addition, I’m a fan of culture and history, which is inherently tied to the past. I’m a fangirl for visionaries in the art and music fields who influenced culture today. If you’ve ever read biographies of icons like Picasso, Edie Sedgwick, or Keith Richards, you know that these lives can be stranger than fiction. What was the first CIRKEL event, and did it confirm that you were onto something? It was focused on exploring the changing publishing industry, from book and magazine publishing to digital media. The editorial director of Meredith Corp, Diane di Costanzo, gave a fascinating survey on the industry from her own personal experience. When I saw my younger brothers’ friends having meaningful conversations with people 50+ whom they would never normally cross paths with, I knew this was the beginning of something big. Groups of intergenerational guests (who had never met before) were so caught up in conversation that I had to kick them out at the end of the night because the venue staff had to clean up! What’s a standout memory from an event you can share? Anna Wintour (editor-in-chief at Vogue) came to the last event called “CIRKEL: fashion,” and I was so surprised I lost my breath for a second. 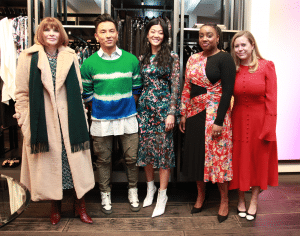 The best part was that she came to support her mentees, who were two of the Condé Nast editors on the panel: Michelle Lee (Allure) and Lindsay Peoples Wagner (Teen Vogue). That kind of intergenerational support is so fitting for a CIRKEL event. Average attendance is typically around 80 people, but this event sold out at 100 tickets. Are there common themes in the feedback you hear from attendees? I’m surprised how grateful so many guests are for being given the opportunity to meet people from different generations. Whenever I get those follow-up thank you’s after an event, I’m reminded why CIRKEL is important. How do you pick the speakers and reach people from different generations? Up until this point, we’ve found speakers through personal connections — except for Charles Broskoski (Co-Founder of Are.na), whom I cold-messaged on LinkedIn. I was lucky he was open to hearing my pitch! I expect getting people outside my network involved may get easier as I produce more events, and attendees spread the good word. What do you hope CIRKEL achieves, both pragmatically and more holistically? I hope CIRKEL changes young people’s perception of older generations, as they realize that olders are an invaluable resource for learning and growth. In turn, I hope olders learn new skills from youngers and eventually are able to keep working (if that’s what they want to do) or retire in a way that makes them feel connected, fulfilled and engaged in society. I imagine a world where experienced workers are able to put their skills and knowledge to use as they live longer, and the general population finds a rhythm of passing knowledge to the next generation through meaningful friendships. I see a new social structure where people are not living in age silos and are leading happier and more connected, enriched lives. In the spirit of Jeremy Heimans and Henry Timms’ book New Power, I want CIRKEL to continue to grow and expand into as many communities as possible. New York is my home and such a hub for career development and culture. But the next CIRKEL event will be in San Francisco and I’m so excited to see how people there respond to the experience. I’d also love to expand to Los Angeles and London this year. What’s the best way for people who are interested to get involved? Sign up for the CIRKEL newsletter. That’s how event invites are first communicated. The website also has photos from past events and more info on the CIRKEL philosophy.